A group participating in this year’s Job Shadow Day stands outside UH Hilo’s chancellor’s office. 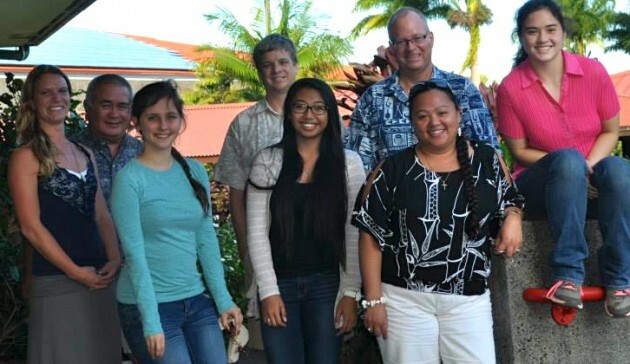 (l-r front row) Katie Schwind, project coordinator; student Bethany Anderson; student Sherry Anne Pancho; Farrahmarie Gomes, director at UH Hilo’s North Hawai‘i Education and Research Center; (l-r, back row) local farmer and businessman Richard Ha; Steve Colbert, assistant professor of marine science; Bruce Mathews, dean of the College of Agriculture, Forestry, and Natural Resource Management; student KaMele Sanchez. A group of enthusiastic Big Island youth recently visited a variety of programs at the University of Hawai‘i at Hilo as part of the national Job Shadow Day. The local group’s activities were organized by the Sustainable Hawai’i Youth Leadership Initiative or SHYLI. Members of SHYLI, made up of high school students, spent time with Bruce Mathews, dean of UH Hilo’s College of Agriculture, Forestry and Natural Resource Management; Michael Shintaku, professor of plant pathology; and Maria Haws, professor of aquaculture and director of UH Hilo’s Pacific Aquaculture and Coastal Resources Center at Hilo Bay, among others. “The farm is extremely self-sustained, culturing their own algae, spawning their own oysters, and raising and selling them for profit,” says participant KaMele Sanchez, a student at Honoka‘a High. The group also spent time with Mayor Billy Kenoi, learned about the Hawai‘i County Food Sufficiency Baseline Study, visited with local farmer and businessman Richard Ha, and talked story with experts on geothermal production. 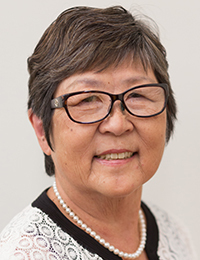 Participant Sherry Anne Pancho, also from Honoka‘a High, shadowed Linda Connelly and Aaron Jacobs, professors at UH Hilo’s Daniel K. Inouye College of Pharmacy. “We are very impressed with Sherry Anne and SHYLI’s efforts to provide Hawai‘i’s students with firsthand experiences in potential career paths and believe this is a valuable investment in the sustainability of our future workforce,” says Professor Jacobs. Group participates in Oceanit reception on O‘ahu via video conference in Chancellor’s Office. A reception was hosted on O‘ahu by Oceanit, Hawai‘i’s largest and most diversified science and engineering company, where students shared their life-changing experiences with business, government and academic leaders. Oceanit is a recipient of the Corporate STEM Award for its support of the development of future leaders. 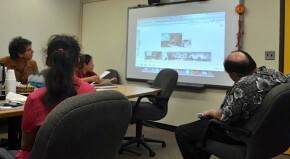 The Oceanit reception was simultaneously video conferenced to the chancellor’s offices at UH Hilo where Big Island SHYLI youth and their mentors shared their experiences with Matthew Platz, vice chancellor for academic affairs, Steve Colbert from the marine science department, biologist Pat Hart, Dean Bruce Mathews, and Farrah Gomes from UH Hilo’s North Hawai‘i Education and Research Center. Group participates in video conference. Members of the group also visited with Hawai‘i Electric Company (Renewable Energy Program), Aloha Veterinary Center, Rainbow Friends animal sanctuary, and state legislators. The National (Groundhog) Job Shadow Day, a national campaign gives young people a new perspective on their studies through hands-on learning and a one-day mentoring experience. It gives youth a positive experience of the world of work, promote a good work ethic, and develop longer-lasting relationships that contribute to the global economy. It is a joint effort of America’s Promise – Alliance for Youth, Junior Achievement, and the U.S. Department of Labor. Nationwide, more than one million students and 100,000 businesses participate, and more than 2,000 restaurants and hotels hosted nearly 20,000 students. Young people are matched with businesses and professionals so they have first-hand experience about jobs in their fields of interest. SHYLI’s Job Shadow Day helps translate youth passion with practical experience for careers of the future. Through intensive year-round fellowships, the Sustainable Hawaii Youth Leadership Initiative is training young people with promise to become leaders, initiators of change, who may leave for periods to gain academic and life experience, and return to create opportunities for themselves and their Island communities. SHYLI targets these youth as fellows, and in our experience, many of the connections they gain throughout the sustainability community, through Job Shadow Day, the Youth & Community Leadership Forum, their Sustainability-In-Action project development, their presentations to schools, organizations, businesses greatly benefit everyone – now and in the future. SHYLI is a project of the Stone Soup Leadership Institute has been organizing Job Shadow Day on islands for ten years. Founded on the island of Martha’s Vineyard in 1997, the Institute’s trains young and emerging leaders on Islands. The Institute’s multifaceted educational curriculum, Stone Soup for the World: Life-Changing Stories of Everyday Heroes spotlights 100 heroes who changed their lives by helping their communities. It’s programs foster service learning, entrepreneurship, STEM-thinking, eco-tourism, workforce development, community engagement, global exchanges for best practices of island sustainability. SHYLI is especially committed to helping to build a local green workforce.